Join Rabbi Chaim & Rebbetzin Shula Bryski for a Traditional, warm & interactive Passover Seder. Enjoy fine wines, full dinner, and crispy hand-made Matzot. Celebrate the Holiday of Freedom at a Seder experience that will empower your daily living and delight your senses. 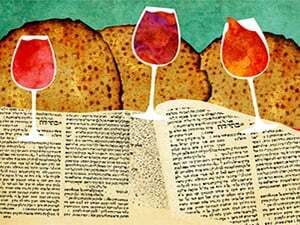 Second Seder, Motzei Shabbat, April 20 at 8:30 pm; please call us at 805-370-5770 to reserve. Passover Eve, Friday, April 19 at 11 A.M. - Please join us for our annual Bread-Burning Ceremony. Join us for a mystical and delicious meal. Shabbat afternoon, April 27, at 6:30 P.M.
Click here to sell your Chomets online, plus everything about Passover, from how to burn your Chametz to Matzahball recipes.